Sam Warburton says he is considering the remainder of the Pro12 season to be a 'trial' for selection on Wales' summer tour to New Zealand. Warburton wants to use the spur of helping Blues qualify for Europe to secure his spot on the three-Test tour in June. Four successive wins have put the Blues just a point outside the Pro12 top six. 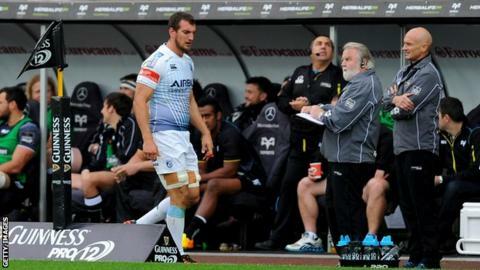 "That is how I approach it, making it show that I am worthy of a place in the Welsh team," Warburton told BBC Wales. The eighth-placed Blues have two games remaining, starting with the Judgement Day showdown with Ospreys on 30 April at the Principality Stadium. They then visit direct rivals Edinburgh, currently sixth and a place ahead of Muster, on the final day of the campaign on 7 May. "I have felt like the last two games for the Blues have been a trial for Wales if I am honest, there are some pretty big personal battles all across the field," Warburton said. "You get a lot of respect for performing well in Welsh derbies, individually and as a team and for me personally, I have felt the need to prove myself all over again in a Blues shirt after the Six Nations. "I still feel I have a point to prove when it comes to Welsh selection because I want to make sure you can go into the New Zealand tour, hopefully having your hand held up as one of the form players." Dual contract star Warburton says a return to his beloved Blues has been the perfect way to get over Wales failing to win the Six Nations. "I did okay, but didn't do as well as I would have wanted and I really felt like I owed the Blues some big performances. "Because I'd had two-and-a-half games after the World Cup and before the Six Nations, which isn't enough really and I just wanted to play a lot more rugby than that for the Blues. "I am a Blues boy, it runs in the family. We are fans more than anything." Warburton is relishing the prospect of returning to perform in front of a bumper crowd on Judgement Day, saying the experience is likely to be unforgettable for his teammates who do not play international rugby. "So few people make it to play professional rugby and then get to play in a massive occasion such as Judgement Day," he said. "Only the international boys get to play in front of crowds like that and even then, it's a handful of times a year. "So for the boys who don't play international rugby, to go to the Principality Stadium makes it a massive occasion. "It's great for all the boys, but especially them."